When Noland Keaulana was growing up, he was always seen following his legendary grandfather, Richard “Buffalo” Keaulana, on the beach. Each morning, they would set out for a morning session, and he would assist his “Papa” unloading boards and helping in any way possible. 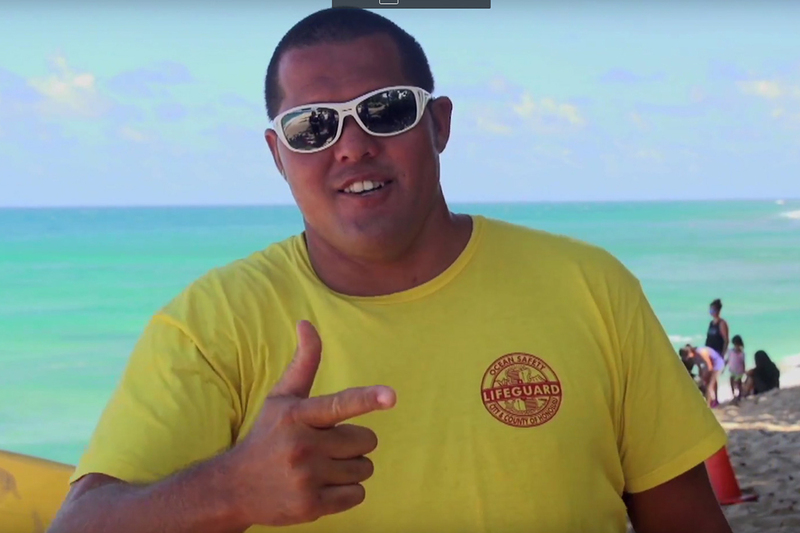 As he grew, he assisted in the lifesaving duties at the Makaha competitions, whether it was helping out his grandpa at the Buffalo Big Board Surfing Classic, the Quiksilver Makahiki, or his uncle at the Braddah Mel’s Surfing Canoe Surfing Competition. From an early age, he patrolled the beach, emulating the great teachers that he had in his grandpa and uncle, former lifeguard and personal water craft (PWC) lifesaving pioneer, Brian Keaulana. Noland’s siblings include his twin sister, Nohelani Martin, and brothers Brandon Martin, and Keone Keaulana. The lifelong surfer, whose all time favorite surfer is Buffalo Keaulana, is one of the quietest watermen around. He appears introverted, almost shy, but has many accolades from surfing giant Makaha, crossing the Kaiwi Channel (Molokai Channel between Oahu and Molokai) on a Stand Up Paddleboard, and expertise in OC-1, four man surfing canoe, six man canoe, longboard, bodyboard, body surfing shortboard, and even “Burger King teay surfing,” he remarked with a smile. He is so accomplished that he has sponsorship, including Maui Jim Sunglasses, Sun Bum Sunscreen, Real B Voice, and Art in Surf. Noland and his wife Christina raise their two sons Koanui (5) and Makana Kai (3) on the island of O’ahu. Each of their family members are active in the ocean, as well as in basketball, swimming and even hula. “I’m busy working a lot, so my wife has them in all these activities. My wife actually taught the boys to swim and boogie board. One of the challenges of being a lifeguard is working weekends, all holidays and breaks, and getting home after dark. They’re really well rounded kids with tons of energy, so I’m grateful she can keep up with them! When I take my boys surfing, I am worried about them getting hurt by kooks, so I just ride the face so they have fun. If it were just me, or tandem surfing with my wife, I’d try to hit the lip or do something more radical. I don’t train like some of those guys who are all into the Hawaii Kai runs and eat power bars. I enjoy tossing my sons into shore breaks on their boogie boards and surfing on my soft top. I’m not really a showboater when I’m with them. His quiet demeanor, genuine humility, and fierce discipline were gained by observing the very best watermen in the world, and growing up in, and among, the best waves in the world. 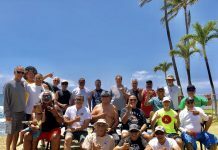 Being raised in one of the toughest surfing grounds around, where “aloha” is encouraged, and “respect is key”, Makaha is where his ohana (family) raised him. Along with his lifesaving duties, Keaulana has also followed his uncle and grandpa into the “movie business.” Some of the recent productions that he’s worked on include Soul Surfer, Battleship, and The Descendants. “I got to meet some famous people…I guess they’re famous. Mostly, we just focus on keeping them safe.” He continued, “Dennis Quaid wanted to learn to surf when we did Soul Surfer so that he could get into character. I took him out at Makaha on an eight foot day! That was hilarious. I also met George Clooney during the filming of The Descendants. My wife was pregnant back then and thought he was hot. I thought, that old haole guy, what?